The installation consists of two pieces: the two chairs intertwined and the floating ghost chair that hangs above. 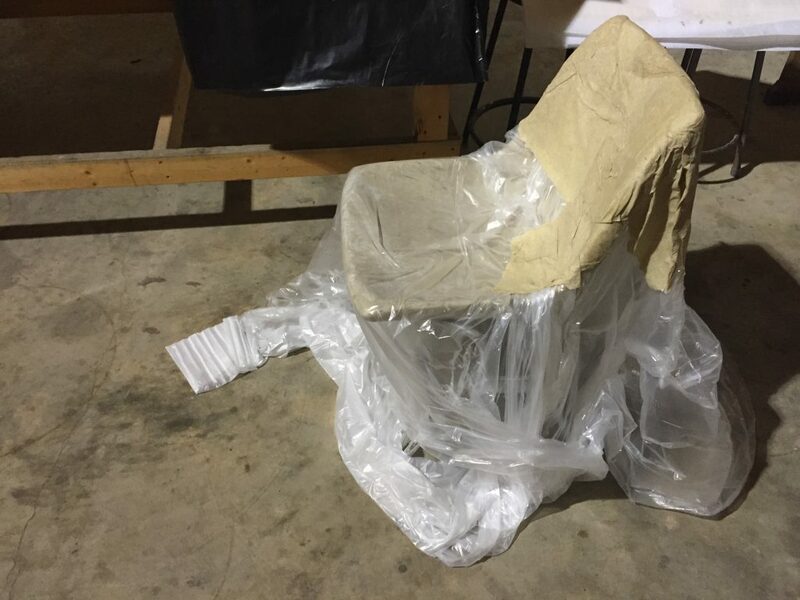 The metal chair was hand worn down and aged. Then, the two pieces were taken apart and adjusted in order to come back together as one united whole. 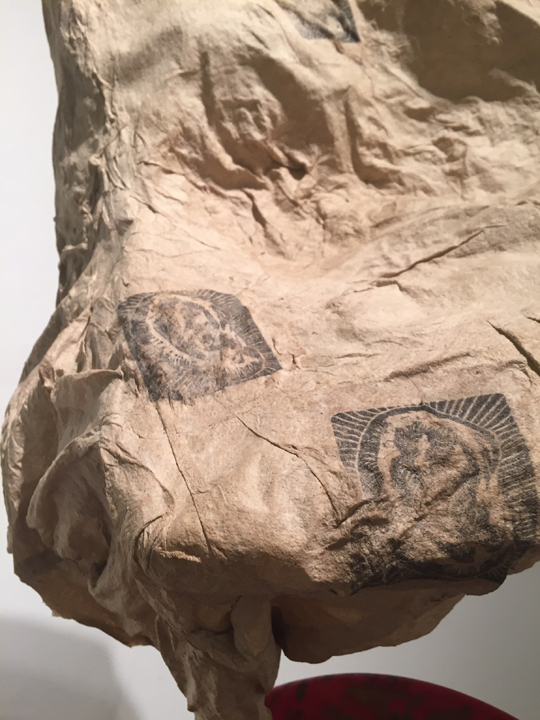 This close-up highlights the beautiful details in the handmade paper and hand printed relief of a human ear. One detail that cannot be seen from these photos is the sewn steel beads along the top rim of the ghost chair. Master craftsmen in Namibia sculpted the beads. Their stories influenced my experiential piece. The fiber combination was chosen for its strength, shrinkage, and visual qualities. The fiber was beaten in a Reina beater and then sheets of varying sizes were pulled. 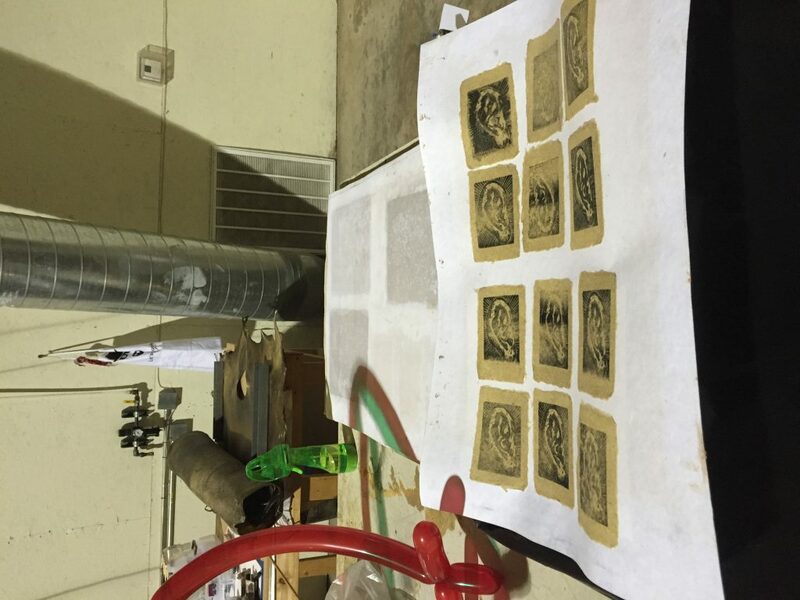 Before they had a chance to dry, they were pressed together around a chair form to make the book work. It was imperative that I work fast and efficiently in order to finish. The ear relief prints also had to be applied to the paper while it was still damp. In order to get the distressed quality and impression that I desired, I hand printed each ear. I went through weeks of testing to get the desired final look for the artwork. This digital video clip depicts the book installation and book unique gentle movement in a gallery space. The book is deconstructed and only the ghost of it remains. Two cultures united in a conversation, information passing between cultures. We are talking, observing, and listening. The final birthed memory and history remain, lingering, and delicate. In Namibia, the chief would be the first to get a chair to sit off the ground. The chief held the power and ultimately, was the one responsible for transmitting the village’s traditions to the next generation. 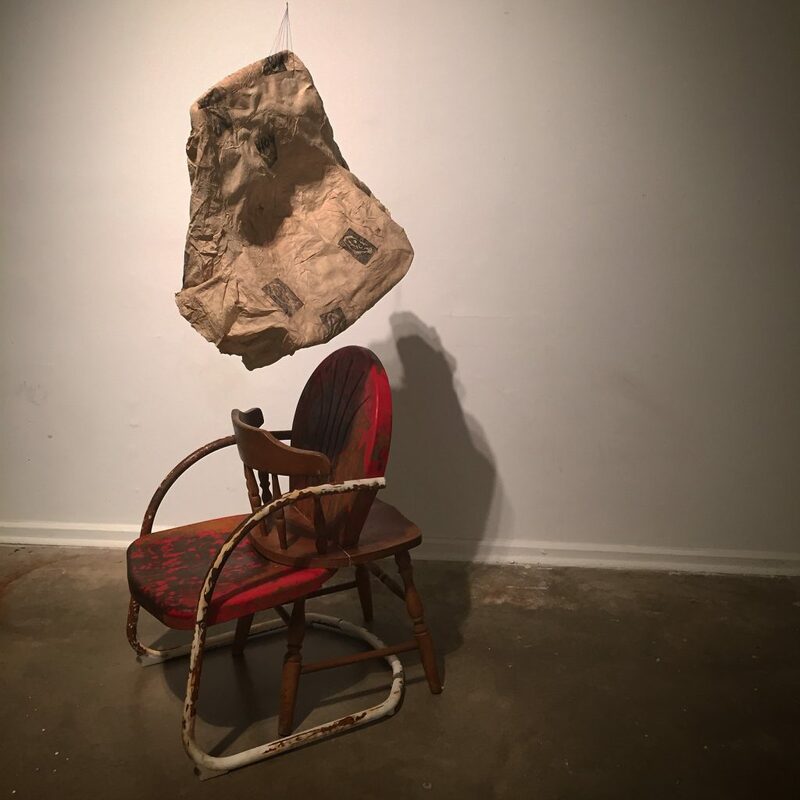 The ghost chair represents what remains of these conversations ¬– deteriorating oral traditions. The ears depicted on this ghost chair speak to the build up of this material culture that is based on listening. I conceptualized this piece after an extended research trip to Namibia to document indigenous craft process through video and photography. That experience inspired a book work series and installation called Namibian Craft: the Unknown & the Outsiders. While I can’t predict exactly how my work will evolve, I do have a call to action. My work always begins with research and environmental immersion. I research and examine each local culture to determine important topics and areas of discourse. I gather physical materials and books. Then, I will reflect on that research through a variety of expression methods and materials. This is my repetition of process that helps me grow as an artist. My artistic process is a direct reflection multi-dimensional background in documentary, book arts, and sculpture. Imagine artworks that are rooted in exploration, research, and storytelling that expose technical abilities in video, photography, and bookwork. The final products range from installations, to small press publications, sculptures and films. The common themes that have emerged from my work include questions about personal identity, the importance of cultural preservation, and a curiosity in ethnographic explorations. My mission is to leave a lasting contribution to the fields of ethnology, docujournalism, and book arts by pushing the boundaries and borders of those genres.